Should baby Zoe the newborn Spawn of Sean have her name spelt with an umlaut or not? When was it all written? Well obviously you can read the dates, but it was during those halcyon days of University education and early careers. Our housemates at University did sup from the aforementioned drinking device and it seemed ever so witty after the consumption of many a distilled alcoholic beverage to register the domain drinkfromthefurrycup.com. Of course the following day we needed to figure out something to do with the damn thing. 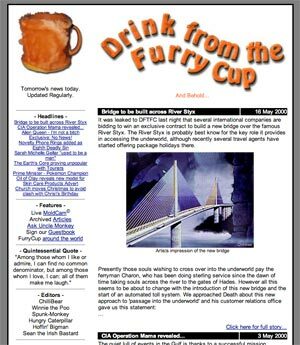 The name quickly came to mean nothing and generally the site was just known as dftfc.com. Being a fan of the Onion (_archeologists discover ancient race of skeleton people_) back in the day satire seemed an ideal option and the site was born. The editors were simply a group of friends with ahem differing opinions on what was okay to write. However our court held few rules, some editors relished in poor taste and offence, others felt their lyrical works more refined. Never one to erase history let this stand as a testament to the past. Some of it good, some of it poor taste, some of it utter rubbish. Back in the good old days we did get an offer to be bought by UGO. Which was nice. We turned them down - I think we thought we had greater plans! The site design has evolved over the years, but generally has kept to the same look and feel. At first it was all driven with a custom set of Perl CGI scripts, then later we committed the cardinal sin of using PHP. It became a mostly static site during the long years of limbo and finally now emerges from the ashes phoenix like as Jekyll powered site converted mainly to markdown. 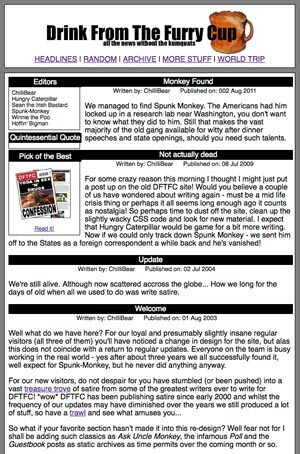 A lot of the original material has been put back into this version, we're considering a slightly edited version of _Ask Uncle Moneky_ and the _Guestbook_, both of which did end up cutting things a little close to the wire in terms of taste. Still we're not ones to re-write history (too much)! Does the mug still exist? Yes it's floating around somewhere it seems wrong to get rid of it! Hopefully one small nugget of this site might raise a smile if you read through.